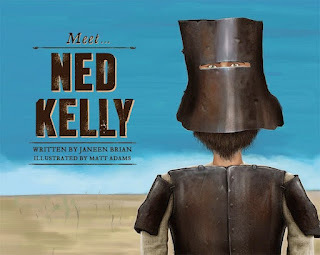 Meet... Ned Kelly is a children's picture book written by Janeen Brian, illustrated by Matt Adams and published by Random House (2013). Review edition is a hardback, RRP $19.95, ISBN: 9781742757186. “Ned Kelly, you are GUILTY of murder!” said the judge. Our Ned was but twenty five years old...But his story is still being told.” And so it is, including just earlier this year when his remains were finally interred next to his mother in an unmarked grave at Greta in Victoria, 133 years after his death. 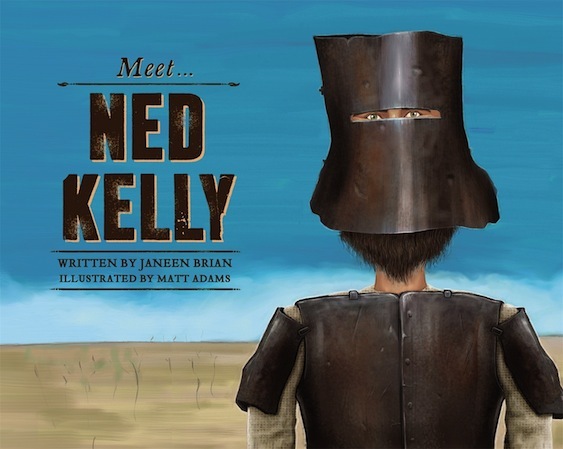 Because he remains such a controversial figure, either hero or villain, Ned Kelly is part of the story of this nation and this picture book version, told in verse by Janeen Brian and beautifully illustrated by Matt Adams, is perfect for introducing him to younger students. It tells the story from his schooldays through to his conviction in an unbiased fashion that will engage and entertain. Students will appreciate that he was just an ordinary kid much like them, but circumstances led him to make some choices that had unforeseen consequences. It provides a great basis for examining those choices, discussing alternatives and debating whether he should be held in the esteem he is. This is the first in a series of books that will feature Australia’s most famous including Saint Mary MacKillop, Douglas Mawson and Captain James Cook. They will fill the gap of being able to introduce younger students to those people they need to know about in a format and language that meets their needs and abilities. This is a great start that bodes well for the rest in the series. BIO: Barbara is a primary teacher librarian with 40 years in education, spanning classroom-based teaching, teacher librarianship, and university lecturing and marking. Over the years she has not only read thousands of books to children but has also been responsible for developing the collections in several school libraries. In 2003 she was awarded Dromkeen National Librarian of the Year, as well as several other national and international awards for her work. She retired from school-based work in 2006 but seems to be busier than ever. Currently, she writes teaching guides to accompany Touchdown, a NSW school magazine assisting classroom-based teachers to explore literature with their students, and she has just launched her own 500 Hats.